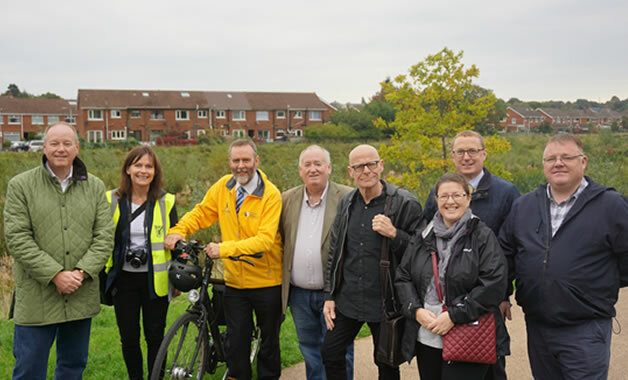 The Northern Ireland Assembly Committee for Infrastructure has today visited the Connswater Community Greenway to see how the park is improving the quality of life for local people. As well as visiting the greenway and its cycle paths, the Committee also received a briefing on the impact the Greenway is having on the implementation of the East Belfast Flood Alleviation Scheme, which is designed to reduce flooding in East Belfast. Chairperson of the Committee, William Humphrey MLA said: “My Committee was very pleased to visit this new public park which is transforming a neglected part of East Belfast into a major public amenity for both local residents and visitors. Not only are there nine kilometres of walking and cycling tracks, five kilometres of river are being cleaned up. “This £40 million investment, which has been developed by the East Belfast Partnership and delivered by Belfast City Council, is an important addition to the East Belfast area. One of the serious issues that it is addressing is helping to alleviate the all too frequent flooding that has plagued parts of East Belfast for years.